alaTest ha recogido y analizado 11 comentarios relacionados al producto Bosch BCH6RE8KGB. En promedio, la calificación para este producto es 4.8/5, al ser comparado con la calificación 4.2/5 de otros productos en la categoria productos. Los usuarios están impresionados con la funcionalidad. Analizamos las valoraciones de los usuarios y los expertos, la edad del producto y demás factores. Comparado con otros productos el Bosch BCH6RE8KGB recibe una alaScore™ global de 89/100 = calidad muy buena.
" Great having different speeds but only used upright so far. The only miner thing is stand it upright it feels that's it's going to fall over but it doesn't. " " Bought this to replace my gtech air ram which was a waste of time. Far better suction and long lasting battery. Buy bosch every time! " " Up to now this is working perfectly. Am very pleased with the item. This was a swop for our Vax animal cleaner which went very hard to push. The Bosch is very flexible and light to push. " 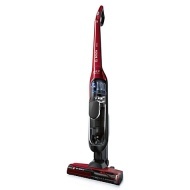 " The vacuum is light and easy to use, it keeps good power on wooden floors which is great for me. The suction on carpets is very good but uses up the battery quickly approx. 20 minutes. I am delighted with the product and would recommend to anyone. " " Very good hover I recommend this "
" this is the first cordless sweeper i have purchased and i am delighted with it. light to handle, great suction, goes any where on any surface plus with attachment great for stairs, car and high places. will not change back now. " " absolutely brilliant - cant fault it "
" This little cleaner is excellent quite light and easy to use quite powerful just as good as a full blown vacuum cleaner but a lot less weight to lug about "